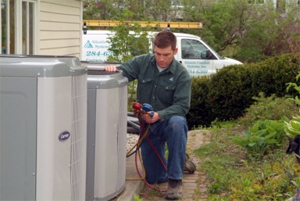 Service Division - Atlantic Comfort Systems, Inc.
Service is our foundation; we have a motto of “Service with Integrity." We take pride in the knowledge and caring of each technician to provide quick response, helpful friendly disposition, clean, orderly and precise workmanship. To enhance the level of service each technician has a cellular phone for dispatching, question answering or calling home; it’s another tool. Our hours are 7:30 a.m. – 4:00 p.m. on weekdays with two technicians on call during the off hours and weekends. The office is open 7:00 a.m. – 5:00 p.m. weekdays. We are continuously training, going to schools and technical seminars and have always been on the forefront of new developments like variable refrigerant flow zoning systems. We shall continue to gain knowledge to better service our customers. Our Company has two distinct divisions (Service & Construction) that work in harmony along with our sister company ACS Controls, Inc., a certified Honeywell installation contractor. To learn more about each division reference the category below.